We had so much fun with the retro candy buttons yesterday, I thought we’d keep things going with more retro candy love. Today’s feature was created by Katelyn James Photography as a unique and whimsical setting for a photography workshop. Not only did it result in some stunning images but amazing party inspiration for us! 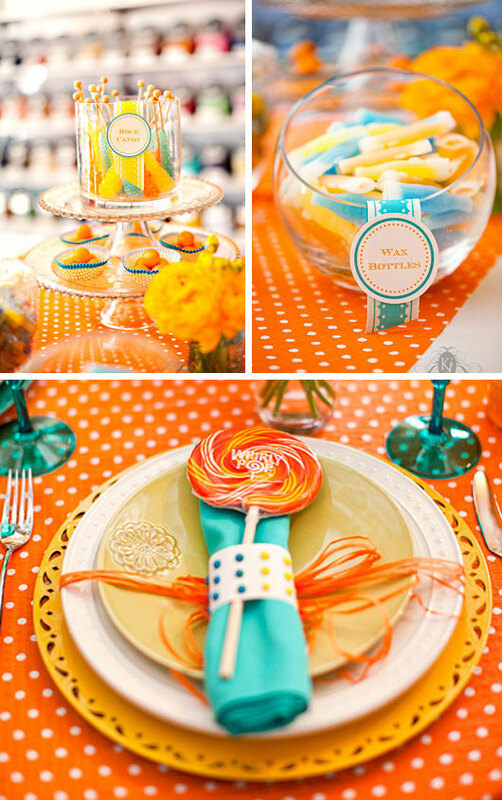 The bright orange and turquoise really pop and the retro candy is overflowing with fun! Not to mention the incredible cake by Shyndigz. 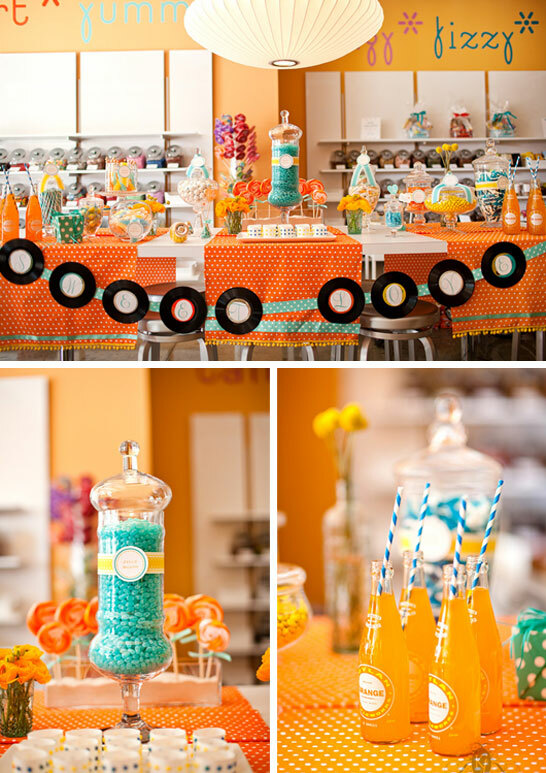 I have a feeling you’re going to love this Retro Candy Inspiration! I just love this cake by Shyndigz! It is a great mix of buttercream and fondant. 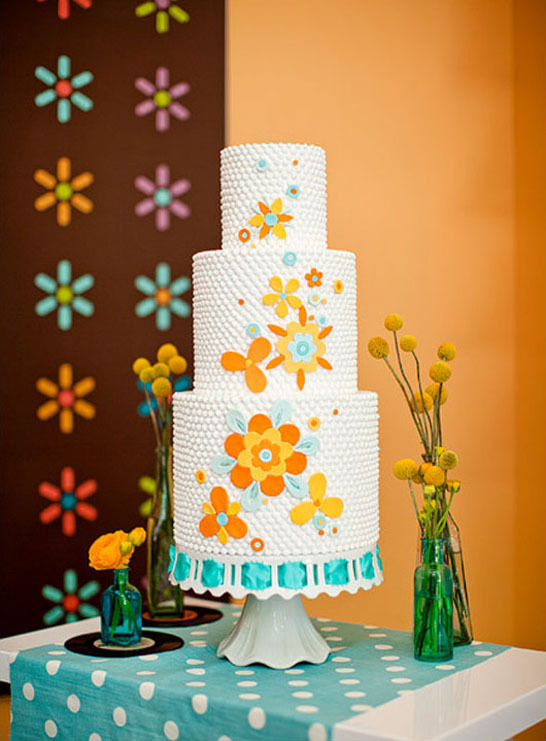 The floral pattern floating up the front of the cake adds the right amount of color and detail without being too fussy or overpowering. The white butter cream dots add a nice textural element as well. Such a great design! Love the flirty cake pedestal as well! Notice the Candy Buttons? 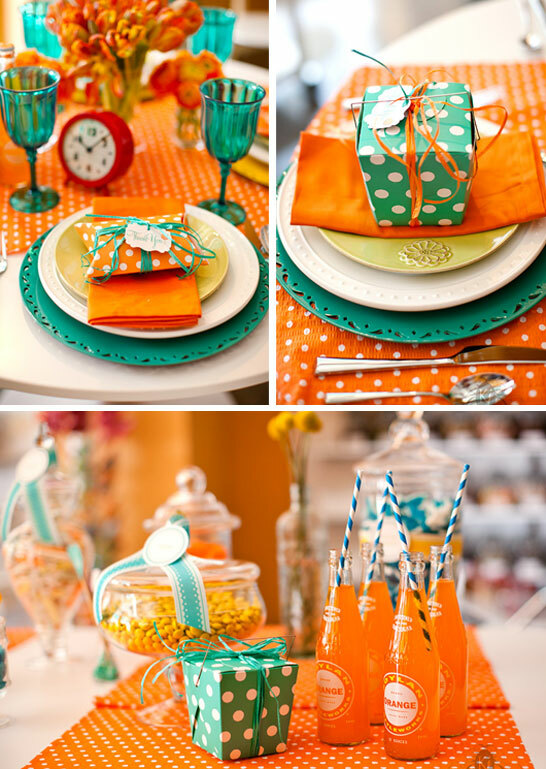 What a fun and clever way to use them… as a napkin ring! Whether it’s for a playful wedding or a child’s birthday, this party would have your guests leaving with a smile (and a nice sugar high!). Hope you enjoyed this Retro Candy Inspiration as much I did. Maybe this should become Retro Candy Week….! 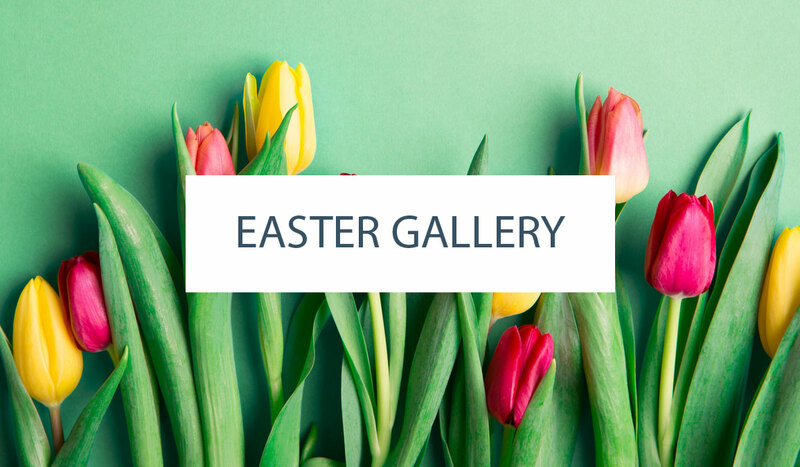 This is beautiful – love the colors! So much fun! 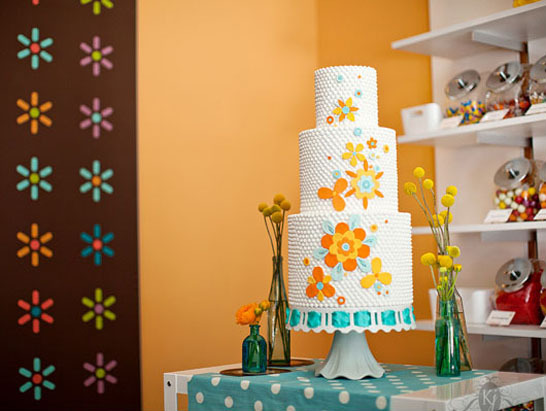 Love the whole set up, colors and the cake! So cute! Where did you get the turquoise and white polka dot runner? I made the runners… don’t look to closely, I’m no seamstress! But I bought the fabric from HobbyLobby and added the fringe! 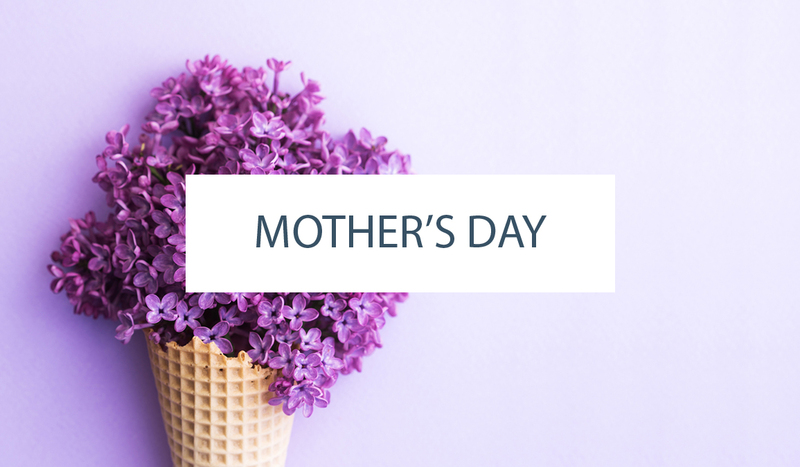 Katelyn – talented in photography, party styling AND sewing! The table runners are perfect! May I ask where the charger plates came from, please? LOVE!!!! I can’t believe the texture on the cake was done with buttercream!?!?! So original. Such an inspiring set-up. Since I first started reading The Cake Blog, I have been inspired to create dessert tables for parties. I am planning to do one for my niece’s 8th birthday this year. Her theme is going to be a fusion of a cupcake/cookie decorating party and things from the movie Frozen. Still thinking how to merge the two but I pretty much have a rough idea on how to do it.